Happy Birthday ( let the days of Christmas movies begin)! Thanksgiving came and went and so did my waistline ,okay my waistline went a long time ago :), but it was a great weekend of giving thanks none the less. I truly do have so much to be thankful for. The weather even dropped low enough for the first fire of the season. and I said “okay”. 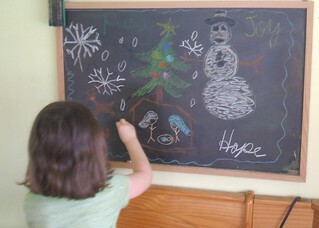 They have also put in a request for a visit to Hobby Lobby with a few decoration “ideas”. 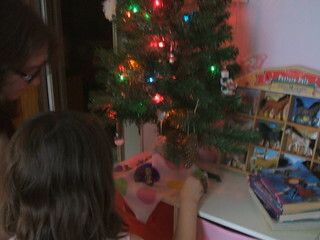 Little Sis was so excited about her tree she didn’t want to come out of her room. However let’s back up a minute so I can “set the scene” of our learning journey shall we. Miss Sky took a sudden interest in wanting to watch Disney’s Alice in Wonderland. This has never been one of her favorite Disney movies because she says “everyone is always so mean to Alice” which of course again I had never noticed. What started the whole thing was she found the Dover story coloring book on the art shelf. She said what caught her attention was the vintage illustrations and just wanted to take a peek, which led to coloring the pages, which led her to read the story, which led to her creating her own illustrations. 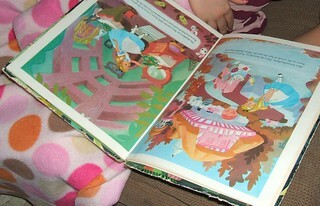 which then led me to bring out the storybook from my childhood. Unschooling is full of leads isn’t it? Add this along with more Kingdom Hearts play and Miss Sky finding the soundtrack for the video game on YouTube, which I now know all the characters themes songs thank you very much. What a shame it would have been if I had been negative of her video game playing. Or if I had kept all my negativity about how many hours she has “wasted” playing this game. As I think back to all she has learned from playing just this one video game alone I shake my head in disbelief at how one time I would have never allowed video games in our home, let alone play for however long she wanted. I can’t help but feel so sad when I read all the negativity parents have to say about video games, yuck. I now cringe when I hear a parent put their child down in front of people because they like to play video games. Please if you can’t say anything nice about your child then do them the favor of not saying anything at all!! Not me I am proud of the girls! I love walking into Gamestop with them and listening to Miss Sky talk to the sales clerks about the new games being released. I love standing in the middle of Half Price Books with my daughter digging through *boxes* of comic books to find the Dark Phoenix Saga. I am thankful to be able to see all that the girls are learning instead of being SO focused on the TOOL they are learning from! Anyway games? Yes. We played the board game Sorry as well as playing Mario Party 8, the board game from Wii Party, and more Family Game Night together as a family on the Wii. Both girls played Minecraft and at girl games.com. Miss Sky even found Super Smash Brothers to play on-line. Little Sis played Jumpstart on the computer and more Paint Splash on the Wii. Miss Sky has mastered scrambled eggs all on her own. She even is grating her own cheese. What a help it has been that she is finding her way in the kitchen. It is mainstream opinion that unless I “teach” the girls responsiblity they will never learn it. It is also mainstream opinion that I needed to punish, shame and spank the girls or they will grow up to be unruly and disrespectful. Children need a more experienced *partner* to help guide them so they can learn more about the world they were born into *not* a warden. Yes children will make mistakes we all do, the difference is the girls are gathering the tools needed now to keep them from repeating. Homeschooling is not for everyone, schools need to exist and I am thankful there are people who dedicate their lives to teaching (I never know if I may need to send the girls to school). Unschooling is not for everyone either, it is not the easier way to homeschool. It takes dedication to be your childs(ren) partner. It takes dedication to keep your family’s relationship top priority, and it takes trust. Trust in your child(ren) and trust in yourself to know who they are now, not some “dream image” of who you want them to be in the future (I don’t know what *my* future holds). I want to end this post after a weekend of Thanksgiving with a picture I took yesterday. When I first journeyed down this path of radical unschooling the hardest thing for me to “let go” was the thought that the girls, especially Miss Sky, didn’t like books. See I love books! In the beginning I tried many times to set up “read aloud” times but they always ended up feeling forced or with me disappointed because 1 child would get bored with the story. I finally stopped pushing the issue and then dropped it all together. During that time not only was I “reading a little” I also began “watching”. Little by little my eyes started to see everything they were doing. I started to see how much reading they were doing daily without “books”. I faced what it was *I* feared so much about them not liking books and realized how many ways there are today for the girls to enjoy a great story. I started to see that books were just one of *many* tools out there for the girls to learn from. I started to enjoy some of those other tools *with* the girls instead of forcing them to like mine. Today I still love books and snuggling up on a rainy day with a hot cuppa tea and a good book but I don’t see it being any better than watching a movie or playing a video game. At one time I was looking to take photographs like the one above, waiting, hoping, wishing for the day. Now when I take pictures I look for joy. I don’t wonder what or even if she might be reading. I don’t even wonder what she might be learning from it, because I see she is always learning. I *know* learning happens all the time and I no longer need to look for it. Wishing everyone peace for the journey! 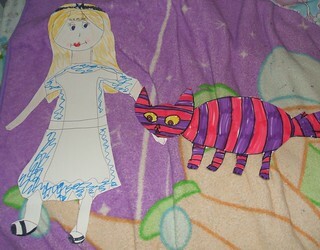 While watching Disney’s Alice in Wonderland including Miss Sky this time. She is referring to Dover’s Alice in Wonderland coloring classic stories (more in next weeks post). I wanted to post this because though I knew she was coloring the book I had no idea she was reading the story too until she mentioned it. 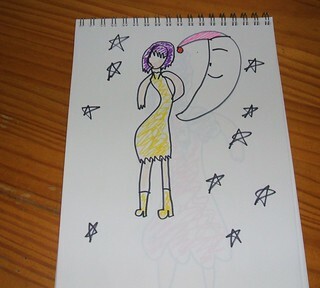 I even had jotted down coloring for my “notes”. I wanted to post this because there is learning taking place in our home that I can’t always “capture”. Don’t have much to post this week. I know there was some family game playing and lots of drawing but this week was mostly settling in for some Littles and preparation for us big people. Oh and there was more “little reading” for me(with new hibiscus tea 🙂 ). So I think this week I will let the pictures do the talking. Wishing everyone a very Happy Thanksgiving (in the states) and peace for the journey! Alright birthdays down, now it’s time to put my focus towards the holidays. Am I the only one who thinks this year blew by? 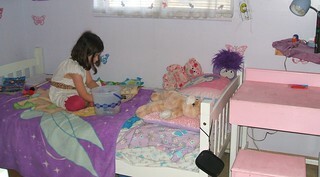 This has been another very productive week, besides a little one turning 7 she also decided it was time to have her own room. Miss Sky is getting at that age where she would like to have a bit more time to herself. Being they shared a room Miss Sky really couldn’t shut the door . 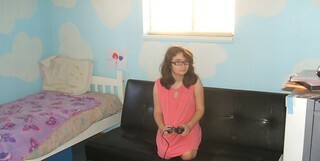 So instead of our old schoolroom being turned into a game room Little Sis now has her own room. This weekend was the first trial and I can not believe how long I held off doing this. They both love having their own space. It was a very productive week as far as learning too. For starters let talk about games like checkers, boy Little Sis is getting really good. Then there was some Frog Juice, Toss Up, Connect 4, and Little Sis tested herself with a brain puzzle, she still needs a little practice. Then later in the week we played Family Game Night, Clue, Life, Wii Party Bingo and the Board game all on the Wii as a family. There was more Minecraft, Animal Jam, BonnieGames .com, and lots more play at Disney Create on the computer. 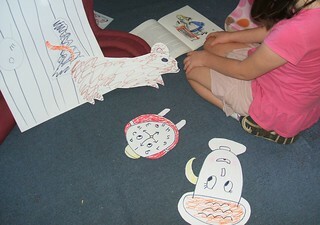 Both girls spent time creating their own comic book stories. Family movie this week was Disney’s Pocahontas where we had family chats about King James, the founding of Jamestown, and the King James bible. Oh yes and of course Pocahontas , John Smith, John Rolfe and the cultivation of tobacco. It still amazes me all the connections one makes from watching just one movie. While watching Disney’s Tarzan Miss Sky caught the name Queen Victoria, “So this Tarzan takes place during the same time period as the Titanic, interesting”. Interesting indeed because Miss Sky has taken interest in Victorian fashions as well(thank you Pinterest) to help come up with her own fashion ideas. I wish I could upload all her pictures, I love her creations. Being that the girls have been busy drawing away Miss Sky informed me she needed new sketch pads and markers so to a Hobby Lobby we did go. I want to add how incredibly proud I am of my girls(all three of them). We went in Hobby Lobby to get new sketch pads and markers and came out of Hobby Lobby only with new sketch pad and markers. The girls not only know now that if the funds are available they can pick out new supplies or a project that might catch their attention but now they understand too. 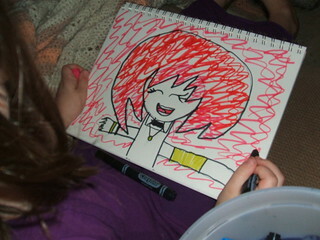 So yes you know there was more drawing, Kingdom Hearts, and more drawing this week and from Little Sis too. There was some reading (besides Kingdom Heart manga) with a new Nintendo Power magazine( sad December is the last month for this magazine, guess I’ll need to find a new video game magazine for Miss Sky to read). Last but not least the girls and I have been watching classic Sesame Street episodes together on Netflix before bed. Little Sis never got to watch Sesame Street because of my anti television days and now she thinks she is too big to watch them. So I asked if she would like to watch them with me and both girls said sure. This has been such fun as I loved Sesame Street (as well as the Muppets) growing up and I get to see some of my favorite characters like the Yip Yips and Bob McGrath(and Maria, Susan, Gordon you get the picture 🙂 ). I can’t believe I even still remember some of the skits and songs. She got her birthday wish for meals as well as a white dress like her favorite Kingdom Hearts character Namine (that I was wanting to get a picture of her in, oh well soon) and the Kingdom Hearts Rechain of Memories game she was wanting. We spent her day playing all her favorite games. She too is saving to get a Nintendo 3DS. While I was typing this weeks blog post. Little Sis: “I just realized there are 3 different kinds of to. There is too, two, and to.” Spelling each one out to me. Then we went into talking about what each one meant. Little Sis actually knew the difference. I told her how there are adults who still get them confused which she smiled at me and said “really?”. So I hope you are not tired of hearing about Sandy yet. Like I mentioned in last weeks post we do not watch the news. I see headlines when checking e-mail on the computer but I choose not to read them, though sometimes I do take the bait then regret it later. However I would be lying if I didn’t mention that hurricane Sandy did have something to do with our learning this week. “What is a hurricane?, Where is the east coast(while pulling out the map), wow that is not very far from us?, Which states will be most affected?” These questions came up in the first place because we felt the winds clear over here in Indiana. These questions were brought out of pure curiosity not fear. Halloween also played a part in our week, not just the dressing up going door to door getting candy part but the picking out what to wear and what makes the best blood part. By the way food coloring does. Speaking of manga busy, busy the girls have been creating their stories on paper,(Little Sis’s character Sad Girl) and at Disney Create. Miss Sky likes to use Disney create to help create the image in her mind then she can copy it down on paper (just a few of her creations). 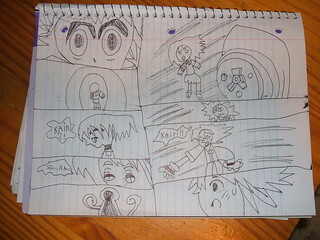 Then both girls spent time using Disney Create’s flip book program making real moving anime. 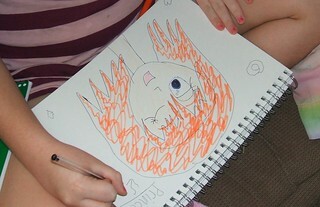 They are getting very good at making splashes, part of Little Sis’s flip book. Both girls spent time playing Minecraft and Animal Jam. 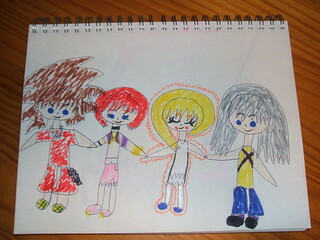 Kingdom Hearts? 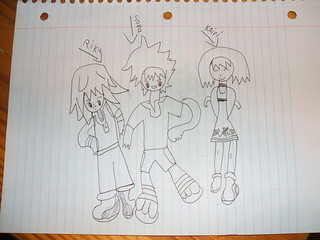 Yep Miss Sky’s been reading at the Kingdom Heart wiki page a lot learning more about the characters. I think it helps her to come up with personalities for her own characters. She is very serious about wanting to write her own manga. Family movies? We pulled out our old favorites, The Great Pumpkin Charlie Brown, Disney’s legend Of Sleepy Hollow, Abbott and Costello Meet Frankenstein and we like to watch episodes of The Munsters and Addams Family. Speaking of episodes we found a new anime series to watch together called XXXholics that we really like. My thoughts and prayers this week have been with those hit by Sandy along the east coast. As we enter into the season of Thanksgiving it is time once again for our family to bring out the blessings jar( each time we think of something to be thankful for we place a “gem” in the jar. Each gem is worth $.10 at the end of December we count up the gems and donate the money to a local charity. Maybe this year we will donate to the Red Cross).We truly do have so much to be thankful for this year. Monday Little Sis turns 7. So we will be celebrating her birthday this weekend. A tradition that Papa and I started for birthdays when we married was to give each other the day off (because we didn’t have money for gifts). Well we have carried this tradition over with our children. So Saturday Little Sis gets the day to do and eat whatever it is she would like (using common sense of course).